In the crazy chaotic world we live in, it’s easy to get so wrapped up in things that we completely forget about one thing that actually matters… ourselves! My life has been extra hectic lately. I had just finally gotten on a good routine for myself, and BAM! Life happens and messes it up. Of course, life’s going to be messed up for the next couple weeks but that’s the way it is. I know in my life and work life, having ‘me time’ is very rare. I’m always running on someone else’s schedule, and I have things to do. As long as I find some time for myself daily, I’m okay. If not, I tend to feel overwhelmed and I get cranky. So next time you’re feeling like a grouch, try to remember the last time you took time for yourself? Maybe it’s something you should start doing. Or if you already have your ‘me time’ what do you do? 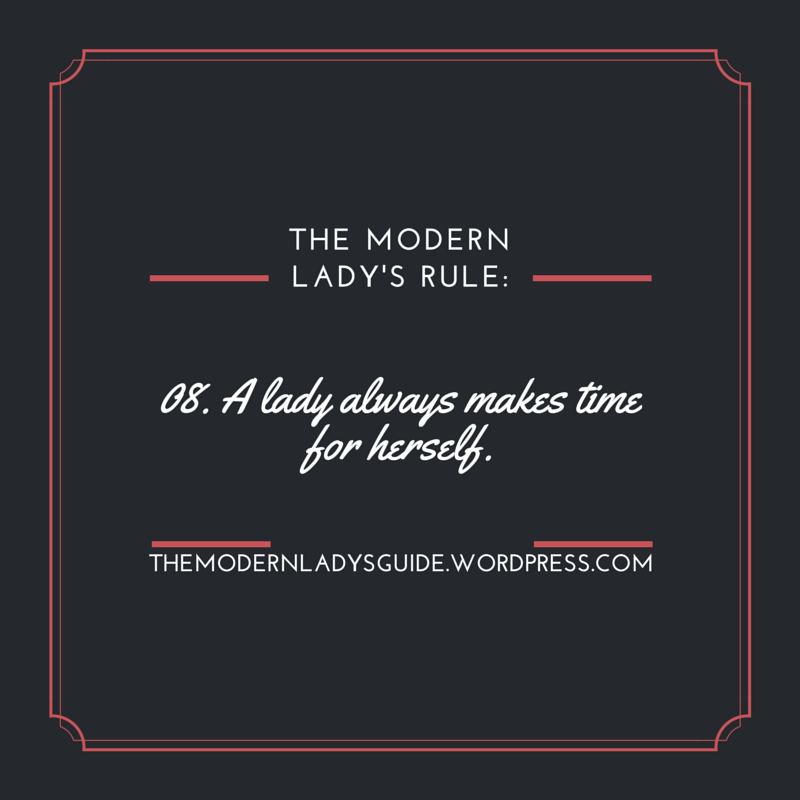 The Modern Lady’s New Rule: A lady always makes time for herself. This entry was posted in Uncategorized and tagged beauty, beauty blog, beauty blogger, cosmetic blog, cosmetics, follow, her, herself, ladys rule, make time for yourself, make up, make up blog, make up blogger, makeup blogger, me time, new blog, new rule, overwhelm, relaxation, suggestions, The Modern Lady's Guide, the modern ladys rule, TheModernLady, yoga, you. Bookmark the permalink.